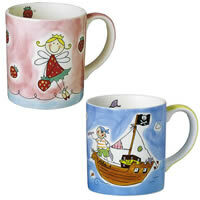 This cheerful and distinctive crockery is sure to make your little one smile. 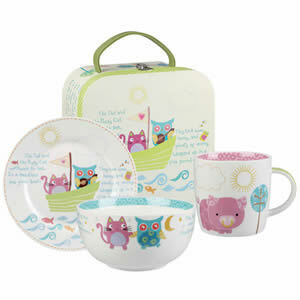 Make mealtimes magical with our unicorn ceramic sets. Made from durable ceramic our gorgeous 3 piece sets will put a smile on your little one's face. Add that extra special touch with our gorgeous personalised 3pc ceramic sets, perfect for those special occasions. 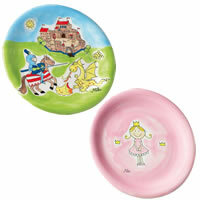 High-quality, beautifully hand-painted Ceramic Children's Dinner Sets in a range of themes. Children will love the fun and vibrant designs including the themes Pirate, Fairy, Knight, Dinosaur, Construction and Disney classics, such as Winnie the Pooh and Bambi. Suitable for everyday use, these sturdy children's ceramic dinner sets will make mealtimes fun and interactive and help a child make the transition from melamine tableware to more grown up tableware. 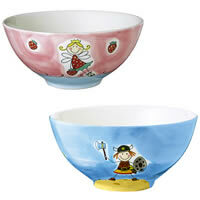 Dishwasher and microwave safe they make special gifts for birthdays and christenings.